We told you all about their last stop in on Music City, for a Halloween throw-down. 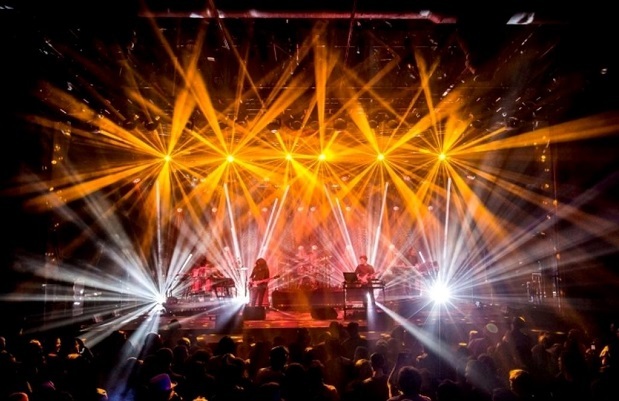 Now the jam-tastic rockers of STS9 are rolling back into town to play War Memorial Auditorium again, on Nov. 14 with special guest SunSquabi. Tickets are currently available, starting at $30, but hop on it, because the headliners bring a good sized following. To fully understand why this is a cannot miss show, and for your chance at a pair of FREE tickets (and an STS9 schwag package), please click on after the jump. Sound Tribe Sector 9, or just STS9 for short, would likely be categorized as a jam band by most, except for by their fans, who reject this label. Through the bands extensive use of electronic sounds, and even sampling, a new sound manifests, vastly different than more stereotypical jam band acts like Panic or Phish. However, a powerful stage presence, affinity for solos, and general attitude of the band and its fans draws parallels with jam band culture we’ve seen before. During their fifteen year career, which started in Atlanta, GA, they’ve churned out nearly ten studio albums, several live recordings compilations, DVDs, side projects, and they’ve also earned nearly legend status on the festival circuit … which they tour as heavily as anyone else. Last time they played War Memorial Auditorium, it was one of the greatest laser-light shows we have ever seen. There is little doubt we’ll be getting any less this go ‘round, so make sure you’re in attendance as well! The Boulder, CO, brewed electronic hydro funk three-piece SunSquabi are the perfect appetizer to an evening of amazing tunes. Playing the jam-fest circuit and touring the U.S. almost nonstop since May 2012, the trio have been getting love from the jam kids and rapidly gaining recognition from the ever-evolving EDM and Livetronica audiences. With a couple EPs and some street cred under their belts, the band have refined their live show, added some bells and whistles, and will also be releasing an album later this winter. With all the earmarks of a group on the rise in the electro-jam scene, get hip now for cheap, my friends, before you’re paying full price to see SunSquabi headline. A winner will be announced Thursday, Nov. 12 at 5 p.m. CDT, and will receive one pair of tickets and an STS9 hoodie and hat. Good luck! STS9 and SunSquabi will perform Saturday, Nov. 14 at War Memorial Auditorium. The show is all ages, begins at 8 p.m. (doors at 7 p.m.), and tickets are available to purchase starting at $30.